Although in terms of area it is one of the smallest regions in Chile, Valparaíso is renowned abroad for its landscapes and architecture. Administratively, it includes Easter Island and the Juan Fernández Archipelago. In addition, visitors are attracted by the multi-colored hills of the city of Valparaíso, the beaches and seaside resorts closest to Santiago, the Portillo ski slopes, and two of the magic-filled homes of poet Pablo Neruda. The capital of the region is Valparaíso, Chile’s principal port. 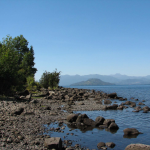 It is situated on a tranquil bay that the Spaniards chose in the 16th century as a port from which to supply Santiago, 119 kilometers inland. The city is built on a flat area, locally known as the plan, where businesses, services, and official buildings are located. Most of its 270,000 inhabitants, however, live on the 44 hills surrounding it. Valparaíso was designated “Capital of Culture” in May 2003, and is the seat of the National Council for Culture. The decision was influenced by the city’s architectural heritage, its traditions, and growing cultural activity fostered by the community and local universities. Just two months later, the city received a higher distinction, when UNESCO declared its historic center a World Heritage Site. This area comprises the Iglesia de la Matriz, a church on the site of the city’s first chapel, built in 1559, its surrounding neighborhood and the site of the city’s first settlements, Cerro Alegre and Cerro Valparaíso, where British and German immigrants settled in the 19th century, and the funicular railways that climb the hills. A variety of economic activities take place in the region. Most of them are connected with the ports at Valparaíso, San Antonio, Quintero and Ventanas. Inland, the valley is mostly devoted to farming; fruit growing, particularly grapes, avocados, custard apples, and nectarines for export, is important. Wine growing has begun in recent years, especially in the Casablanca valley, which for decades had been given over to livestock and basic crops. In the mid-80s, however, it was discovered to be suitable for producing fine wines and, in a short time, became renowned worldwide. Being near the sea, the area has fresh moisture-laden winds that help to produce its distinctive, very fruity white wines, including Chardonnay, Sauvignon Blanc and, to a lesser extent, Gewürztraminer. The region also produces copper, silver, molybdenum, and is a leading supplier various non-metallic minerals. Major manufacturers operate in the region, in oil refining, petrochemicals, tobacco, agribusiness, and foodstuffs. The Valparaíso Region is, above all, a tourist area. Easter Island, 3,700 kilometers from the mainland, is known, visited, and investigated mainly because of its mysterious moais. These colossal stone figures, some as high as 23 meters and weighing as much as 80 tons, were built at ceremonial sites by the Rapanui people who –according to legend – arrived from Hiva Island with King Hotu Matu’a in the 6th century. Its 3,791 inhabitants make their living from tourism, commerce, and fishing. There are a number of hotels and accommodation is also available in islanders’ homes. Two weekly flights link Easter Island to Santiago and French Polynesia. The region has much more to offer, however: beaches and ski resorts, as well as cultural and music festivals. From Papudo to Santo Domingo, through Cachagua, Reñaca, and Cartagena (the most popular seaside resort in Chile), there are around 120 kilometers of beaches, hotels, cabins, and camping sites. The sea, though, is rather cold. Viña del Mar receives visitors from all over the world in the summer, especially from Argentina. It has the region’s best infrastructure and a casino. Each year, in February, it hosts the International Song Festival, with performers from many countries. Inland, together with national parks and nature reserves, there is Portillo, the first of Chile’s great ski resorts. At an altitude of 2,900 meters, a short distance from the Argentine border, it is located on the shores of Laguna del Inca, whose green waters freeze over in winter to form a magnificent skating rink. Portillo has 23 ski slopes and 12 ski lifts, heliski and snowboard slopes, and a hotel with accommodation for 500 guests. In August, it becomes the unofficial center of operations for top-level skiers from all over the world. The 1966 World Ski Championship was held in Portillo, and the world speed record was broken on its steep Jack Rock slope in 1978. Two of the picturesque residences that the Chilean poet Pablo Neruda had in his homeland are in the Valparaíso Region, facing the sea. Neruda purchased his house at Isla Negra in 1939. It was here that he wrote his grandest work, Canto General, and kept many of the objects he brought home from his travels, including seashells and ships’ figureheads – “my biggest toys.” Today, the house is a museum. According to his wish, Neruda was buried here, next to his wife Matilde, facing the sea, in December 1992.